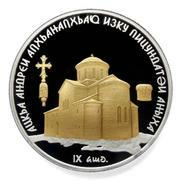 A silver coin “Akua”, which commemorates the anniversary of the city of Sukhum. 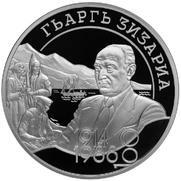 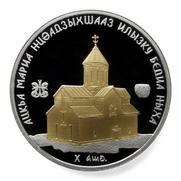 A silver with selective gilding coin “Akua”, which commemorates the anniversary of the city of Sukhum. 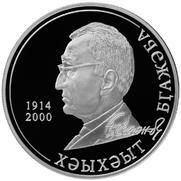 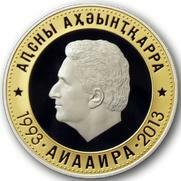 A silver coin “World Domino Championship, Abkhazia, 2011” in denomination of 10 apsars. 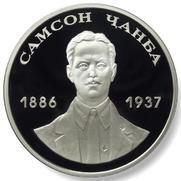 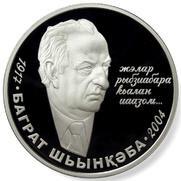 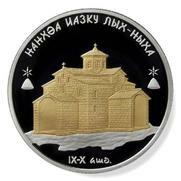 A silver coin “Bgazhba Khukhut Solomonovich” in denomination of 10 apsars. 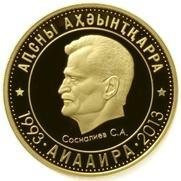 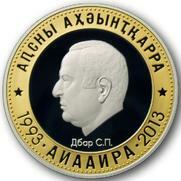 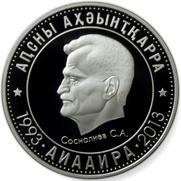 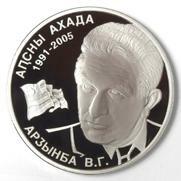 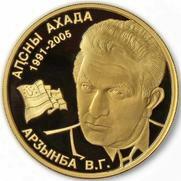 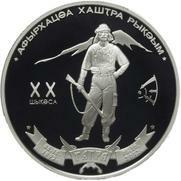 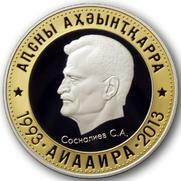 A silver coin “Dzidzaria Georgiy Alekseevich” in denomination of 10 apsars. 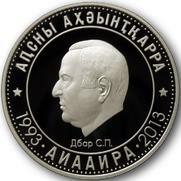 A silver coin “Inap-ipa Shalva Denisovich” in denomination of 10 apsars. 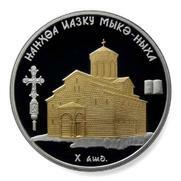 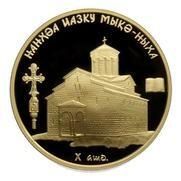 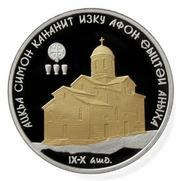 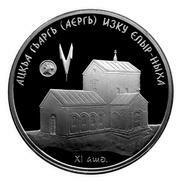 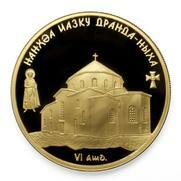 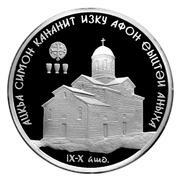 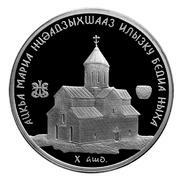 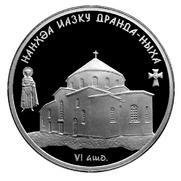 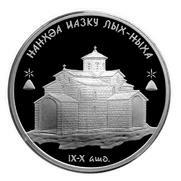 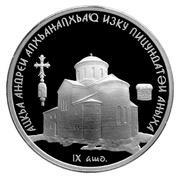 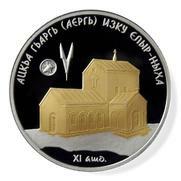 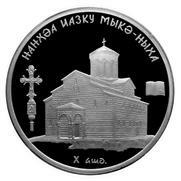 Series "Historical sites of Abkhazia"
Silver coin of 10 apsars denomination "The Dormition Cathedral of Dranda"
Silver coin of 10 apsars denomination "The Cathedral of St. Andrew, the "First-called" Apostle, in Pitsunda"
Silver coin of 10 apsars denomination "The Dormition Cathedral of Lykhny "
Silver coin of 10 apsars denomination "The Dormition Cathedral of Myku"
Silver coin of 10 apsars denomination "The New Afon Cathedral of St. Simon Zelotes, Apostle" of the series "Historical sites of Abkhazia". 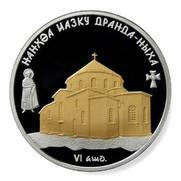 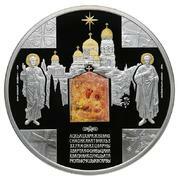 Silver coin of 10 apsars denomination "The Bedia Cathedral of the Holy Mary, the Mother of God"
Silver coin of 10 apsars denomination "The Cathedral of St. George in Elyr"
Gold coin in denomination of 50 apsars "The Dormition Cathedral of Dranda"
Gold coin in denomination of 50 apsars "The Cathedral of St. Andrew, the "First-called" Apostle, in Pitsunda" of the series "Historical sites of Abkhazia". 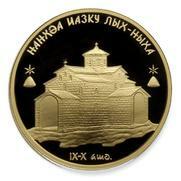 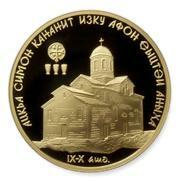 Gold coin in denomination of 50 apsars "The Dormition Cathedral of Lykhny"
Gold coin in denomination of 50 apsars "The New Afon Cathedral of St. Simon Zelotes, Apostle"
Gold coin in denomination of 50 apsars "The Bedia Cathedral of the Holy Mary, the Mother of God"
Gold coin in denomination of 50 apsars g "The Cathedral of St. George in Elyr"
Silver coin of 10 apsars denomination with selective gilding "The Dormition Cathedral of Dranda"
The Cathedral of St. Andrew, the "First-called" Apostle, in Pitsunda"
Silver coin of 10 apsars denomination with selective gilding "The Cathedral of St. Andrew, the "First-called" Apostle, in Pitsunda"
Silver coin of 10 apsars denomination with selective gilding "The Dormition Cathedral of Lykhny "
Silver coin of 10 apsars denomination with selective gilding "The Dormition Cathedral of Myku "
Silver coin of 10 apsars denomination with selective gilding "The New Afon Cathedral of St. Simon Zelotes, Apostle"
Silver coin of 10 apsars denomination with selective gilding "The Bedia Cathedral of the Holy Mary, the Mother of God"
Silver coin of 10 apsars denomination with selective golding "The Cathedral of St. George in Elyr"
Silver coin of 100 apsars denomination with selective gilding "New Afon Monastry"
A silver coin in denomination of 10 apsars dedicated to the 85th anniversary of the Abkhazian State University. 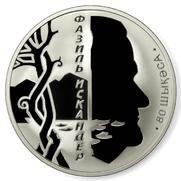 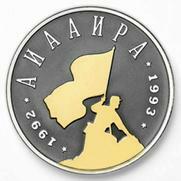 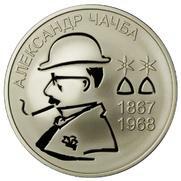 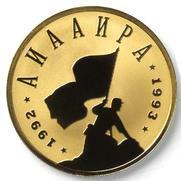 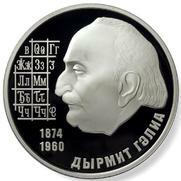 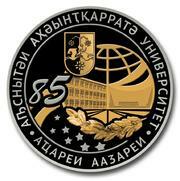 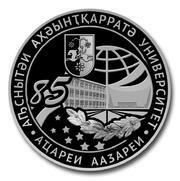 A silver coin with selective gilding in denomination of 10 apsars dedicated to the 85th anniversary of the Abkhazian State University. 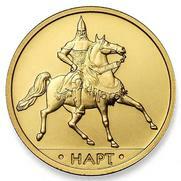 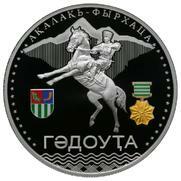 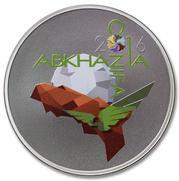 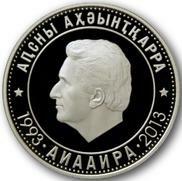 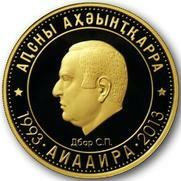 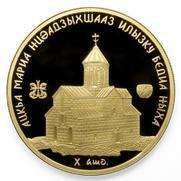 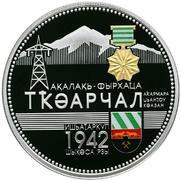 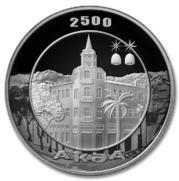 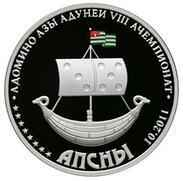 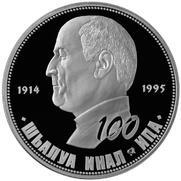 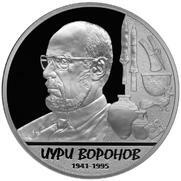 Series "The Investment Coins of Abkhazia"